Humanitarian, feminist, and social activist Gertrude Weil was born in Goldsboro, NC, in 1879 into a prominent family of Jewish merchants. Gertrude Weil attended local public schools before enrolling at Horace Mann for secondary education. While at Mann she became friends with teacher Margaret Stanton Lawrence, daughter of Elizabeth Cady Stanton, one of the founders of the woman’s suffrage movement. Already drawn to public service and philanthropy by the example of her mother, Mina Rosenthal Weil, Gertrude was inspired in part by her associations with Lawrence and Staunton to dedicate her considerable energies to the fight for gender equality and later racial equality. Gertrude went to Smith College in Northampton, MA and studied sociology. She graduated in 1901, becoming the first North Carolinian to graduate from Smith. Upon graduation, Weil returned to Goldsboro and proceeded to engage in a dizzying array of cultural, charitable, educational, and activist endeavors. A petite firecracker “straight-backed, straightforward, but never straitlaced” Gertrude Weil was a founder and president of the North Carolina Suffrage League in 1920, founder and officer of the North Carolina Federation of Women’s Clubs, pioneer president of the North Carolina League of Women Voters, and founder and officer of the Legislative Council of North Carolina Women. She helped create the Wayne County Health Department. She personally paid the salary of a public health nurse for Wayne County in order to prove the worth of having such a position. Weil was a charter member of the North Carolina Association for Jewish Women and served three times as president of that organization. She also served Sisterhood and Hadassah for the eastern states and advocated tirelessly for interfaith communication and cooperation. She worked for labor reform legislation. In 1930, she participated in the Anti-Lynching Conference of Southern White Women, and then joined the Association of Southern Women for the Prevention of Lynching. In 1932, Weil was appointed to the North Carolina Commission on Interracial Cooperation. Having achieved voting rights and having made great progress with gender-based discrimination in general through her many years of activism, Weil began focusing more and more on Civil Rights beginning in the 1950’s. She vehemently opposed segregation and risked life and limb holding integrated meetings in her home in an exclusively white part of town. Her dedication to civil rights remained strong through the decades, and she continued to live in downtown Goldsboro long after most white people left. She formed the Bi-Racial Council in 1963, and when racist front yard hitching post statues became hostile emblems of prejudice in her hometown of Goldsboro, she publicly painted hers white as a public symbol. 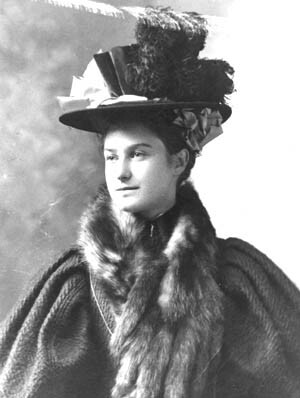 Gertrude Weil, c. 1905. Gertrude Weil Papers, PC.1488.50, State Archives of NC. 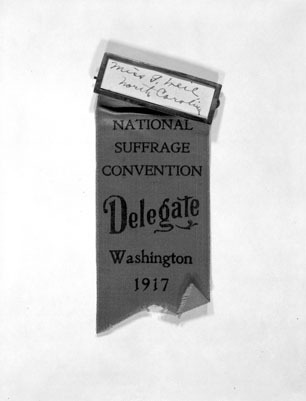 Gertrude Weil’s National Suffrage Convention Delegate Ribbon, 1917. 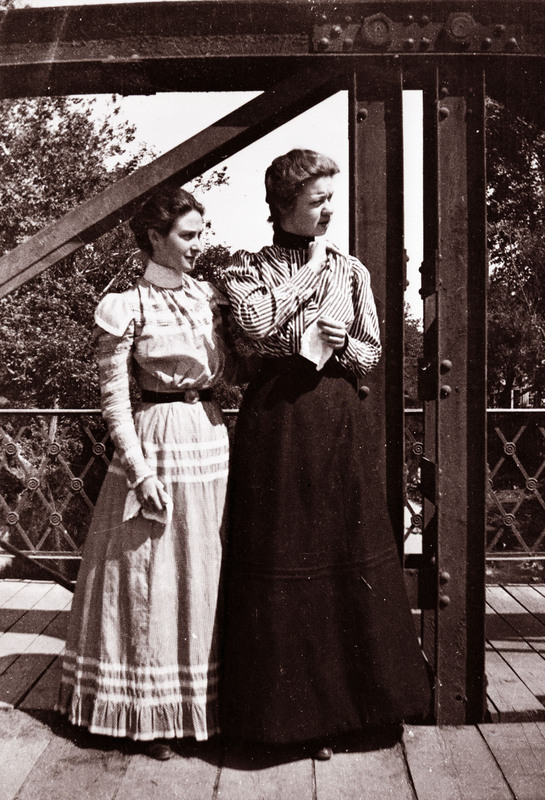 Gertrude Weil (left) and another woman on a bridge. PC 1488.50 Weil Papers, State Archives of NC. In 1964 she was awarded the Smith College Medal. An attached statement read: “It would be a great deal more difficult to find, in the State of North Carolina, a cultural, charitable, educational organization or drive with which the name of Miss Gertrude Weil is not connected, than to attempt to summarize her contributions to the civic welfare of this State.” Many other honors and awards followed, and she remained active and inquisitive throughout the remainder of her life, pursuing not only the causes that had brought so much success and recognition but also interests in historical restoration and theater arts. Weil died at the age of 91 in Goldsboro and is buried in the Hebrew section of Willow Dale Cemetery. She left behind a legacy of social justice and social welfare work and a state much improved by her long career of involvement in progressive activism. Gertrude Weil Flickr photo album, courtesy of the State Archives of NC: https://www.flickr.com/photos/north-carolina-state-archives/albums/72157604162307116. Please see www.ncpedia.org/biography/weil-gertrude to learn more about her life and career.